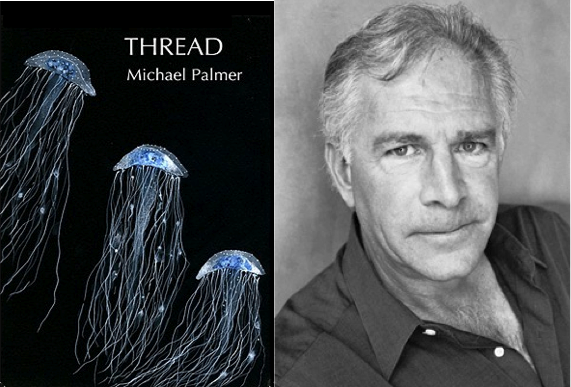 “Thread — Stanzas in Counterlight” is Michael Palmer’s Book of the Dead. The title series of his ninth full-length collection, these eighteen interlinked poems are not elegies in the traditional sense. Neither songs of lament, nor, strictly speaking, commemorations for the departed, they reconfigure the genre. 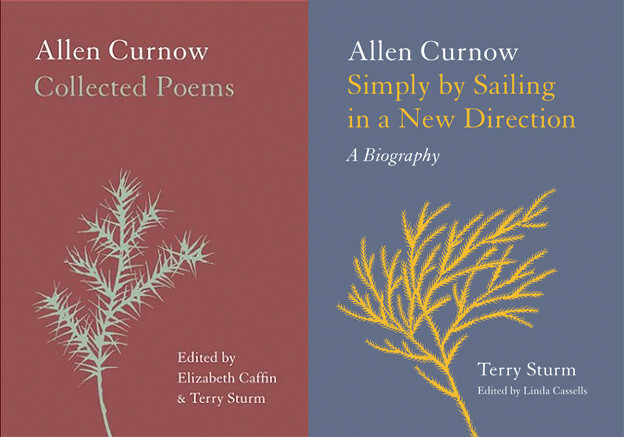 In these extraordinary poems, among the most moving and powerful of his career, the dead appear as companions on the way, intimately joined to the enterprise of living. Thread transforms elegy into crystalline paleography — a writing before writing that is also beyond it. Here, the customary polarity between innocence and experience is reversed. Innocence is not what is lost; it can only be gained. It does not precede experience, but is produced by it. For innocence is not a category of purity outside the travails of experience, but a condition that is achieved only by passing through the sorrows of an arduous contingency. The poems in Thread amply testify to this. In “Transit,” for instance, the sight of Creeley’s final book, On Earth, spurs a mournful, yet consoling, recognition. tongues of cloud and wind. The delicious image of a “swallowed song” rides on a cascade of vowels. The old echoes go with us, through us, speak out of us, again. So many of these poems feel like fragments of an overheard conversation. Nearly every one of them trails a ghostly double, beckoning us, in their uncanny incompleteness, to listen for further, unheard melodies. In “Fragment After Dante,” the first of a three-part series, the poet finds himself stranded in the realm of shadows: “And I saw myself in the afterlife of rivers and fields / among the wandering souls and light-flecked paths” (34). Amid the suffering of the dead, the greatest torment is to hear them speak, “chatting about nothing,” yet failing to understand them. The second Dante fragment resonates with muted pain. In a haunting image, the speaker’s face transforms “from old to young” as she vanishes. Memory’s dream of what-was mingles promiscuously with its hope for the Not-Yet. Throughout, Thread generously acknowledges that its every word is merely on loan from “the thief’s journal,” Palmer’s phrase, by way of Genet, for the floating para-text of unowned language. This is elegy against elegy: not a quixotic defiance of mortality, but a deepening awareness of it; a way to write into and out of finitude. Thinking of the dead this way enables Palmer to do away with appeals to the cult of the personal and its fetish for the unique. “The dead” in these poems name an experience in which loss is only another form of continuity. They are always near and yet irreparably distant. In this way, the poem occupies a Rilkean angelic topos: it circulates freely between the living and the dead without making any distinctions between them. To speak the dead this way is to place them in an order of belonging beyond sentimental coercion. They remain strange and vivid; sheltered within memory, but also outside it; irrefragably singular. Thread inhabits the melancholy landscape familiar to Palmer’s readers, a place where language ratifies itself by signifying its own failure. Written under the agonizing sign of Saturn’s slowness, they are harrowing in their humility and directness. Simplicity here is neither a reduction nor a retreat, but the earned complexity of a late style in a late hour. To call “Threads” a tour de force would only defame it. These “threads” are addresses, colloquies, homages — unanswered questions that concentrate Palmer’s concerns for his art as a site for making counter-meanings, those micro-resistances that push back against the crushing sense of moral fatigue born of loss, suffering, and slaughter. The “stanzas in counterlight” bring together reflections on the possibility of art with poems to fellow writers such as Robin Blaser, Gustaf Sobin, Alexei Parshchikov, Roberto Bolano, and Mahmoud Darwish. In tone and imagery, the series calls to mind At Passages’ “Six Hermetic Songs,” his elegy for Robert Duncan and perhaps the inaugural poem in his Book of the Dead, though it seems he’s always been writing this way, “ahead of all departure.” With its prayers of intercession and spells for safeguarding the soul’s passage through the underworld, Palmer models his own funerary chants for Duncan after The Egyptian Book of the Dead, guiding the older poet into the afterlife of language. 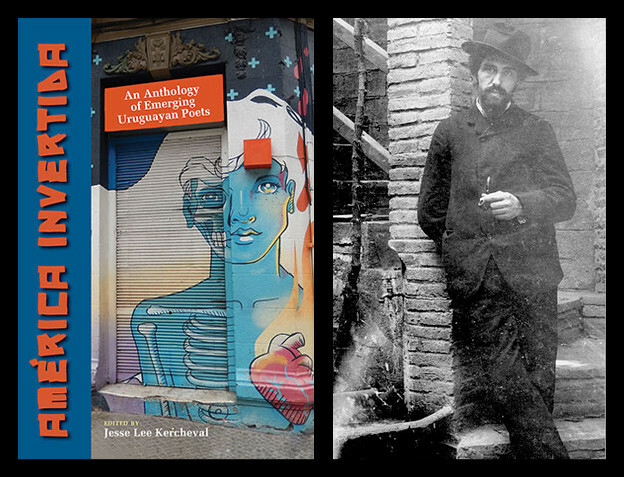 Photos of Robert Duncan by LaVerne Harrell Clark via University of Arizona Poetry Center. This ritualistic language sets the scene for the six sections to follow, each of which charts a stage on the soul’s journey through the hazards and judgments of the underworld in its progress back toward day. Here is the first poem of the series. For Duncan, the arch-mage of postmodern poetry, the dictionary is nothing if not a book of spells, a grimoire by which the poet might conjure a world, or rather, a web of subtle connections between past and present, the vanished and the visible. The suggestion that Palmer’s mentor has entrusted him with his dictionary implies both the passing on of a lineage and a plaintive cry for the restoration of dear earthly objects, like the ones the Egyptians placed in their tombs to ease the dead’s voyage over dark waters. More than that, the dictionary signifies the limitless potential for bibliomantic conjuration, the thief’s journal par excellence. The final poem of “Hermetic Songs” is a kind of summoning: a voice, calling over water, over distance, either in final farewell, or hailing return. and the erasures of the gate. H.D. (undated), via Beinecke Rare Book and Manuscript Library, Yale University. The Bennu Bird is the Egyptian phoenix, a figure associated with rebirth in an afterlife, while the lotus signifies “the divine splendor that belongeth to the nostrils of Ra,” that is, to the body’s breath, its divine measure. The final image is of the poet composing himself with his familiar ink-pot in the resurrected life, writing beyond the ending. Thread is lambent with such figurality. The recurring figures of the bird, the fountain, the book; of Babylon, the moth, the lovers — these are ideas as character, emblems of a spiritual imaginary that supersede and amplify the earlier work’s immersion in linguistic metamorphology. Utterly transparent, they militate against concretion, yet their very clarity renders them enigmatic. They carry over Palmer’s analytic lyric into the key of allegory. In these poems figurality is the idea of form itself. The ideal of correspondence so dear to Baudelaire migrates from the hermetic notion of a mirror that reflects the heavenly in the earthly and the earthly in the heavens, to the fructifying dissonance between word and thing, past and present. Loss prefigures redemption, of course, but only as muted whispers from the realm of ghosts. A devoutly secular alchemist of the word, Palmer invites traffic with the transformative powers of the strange, even as he confutes all claims put forward on behalf of a tyrannical spiritual orthodoxy. The present is the infinite — expansion of the actual into the imagined, the imagined into the actual. If there can be no final truth, or if it is only and already imperfectly figured through language, the dream of alteriority nevertheless persists, in large part because language is structured to imagine its own outside. As a system for shaping interiority by organizing experience, its logic is geared to continually surpass and subvert its own boundaries. Language is thread, and nothing but — weaving, unweaving, reweaving. What marks this chain of likenesses is their unlikeness. Baudelaire’s dream is accomplished, not by an intimate metaphysics, but through a language of dissimilarity. Thread’s allure as a constellating trope, its ability to articulate a grammar of correspondence between unlike things, forms the core of Palmer’s conception of language and its polymorphously perverse power to link by way of dissonance. If silk is a synonym for breath, then evening imitates the action of the eyelid, closing over the field of vision. “Thread to thread” promises an exact equivalence, a braiding of identical things. Yet the necessity of repetition casts a shadow between the first and the second instance of the term. “Thread to thread” invites connection, but the slippery preposition can equally signal a gap. To thread, then, is to work midrashically, for these poems take up Palmer’s abiding concerns with the necessity for dispersing the subject and the concomitant counter-struggle to preserve its singularity, if only as a remnant. In Thread, the figure of the book appears as a messianic object, braiding together now with then, here with there, in a suspension of time where the words of the dead are spoken as one’s own even as the dead speak through the lips of the living. This bewitched chiasmus in many ways defines Palmer’s project, his desire to dissolve and connect, forget and remember, to “add yourself jubilantly, and erase the score,” as Rilke puts in Sonnets to Orpheus. Only in this way can the poem resist succumbing to mere introspective reverie. The oneiric landscape rises, a figural domain porous with primal interiority. Closer to Gennady Aygi (another poet honored in this book) than George Oppen, it hews all the same to the Objectivist credo of austere minimalism, the sense that each word can be arrived at only through patient struggle. Late style in Palmer is a slow concrescence, an exactitude of means. Gennady Aygi image via Beijing Language and Culture University. In this poem to the Chilean poet Raul Zurita, whose most well known work, Purgatorio, recounts the nightmarish imprisonment the poet suffered under the Pinochet regime, the invocation of “the invisible world” where “flowers need no light” but are instead “watered by voices” for the eyeless, attests to the necessity of an inner, allegorical landscape where poetic language can still radiate, free of tyranny and oppression. “The invisible world,” one might say, is the place where disaster is rewritten in a language that translates suffering into the spectrum of recognition. Similarly, the poem to Robin Blaser attends to the intimate undertow of a poetics that knows all it says is said in the shadow of its own vanishing. Moth verges on and merges with mouth, an image of transience and longing fluttering in its “quantum of nothing,” a figure for speech “sounding / beyond our extinction” (81). But this is a sounding that also utters hesitation, each comma starkly denoting the pause of breath in a poem that otherwise refuses final punctuation. Narrow constructionists, the kind of readers who’ve made idols of Sun or Notes for Echo Lake, might deride these slender poems as a falling off, but I find them incredibly moving. They represent the distillation of a lifetime’s attendance to the nuances of a luminous art written under the sign of shadow. What Palmer accomplishes in this book is the meaning of being haunted, poetically – the way a poem burrows into us, becomes an intimate part of our psychic life. Haunting in this sense is not some stubborn refusal to move on after grief. Rather it is an active form of melancholy, a rejection of the proscriptive hygiene for mourning and its insistence on the palliative. It is not a morbid keeping open of the wound, but a preservation of the dead as a still vibrant field of interior force. Far from memorializing loss, it incites recognition. For loss to be loss it must abjure closure. The coda-like lyric for Gustaf Sobin poignantly bears this out. The enjambed syntax performs a liturgical rite, redeeming spirit in a house of words where melodic frequency is attuned to estrangement’s deeper belonging, its “distant home.” The sense of desolation is powerful here because so carefully modulated. It’s consoling, as only the bleakest measure can be. It is the role of the lovers to set fire to the book. and read by the light of the book. Syllables, particles of glass, they pass back and forth in the dark. their voices muffled by the book. “To be figures in the book,” even as it burns, even as its burning illuminates the words on its pages, is to guarantee the promise of “the invisible world,” where the poem is continually remade through a kind of doubling , echoing and re-echoing in a gallery of citations and counter-citations. The book, Palmer understands, will always be “illegible;” its burning at once a source of illumination and obscurity; a figure of music alternating between the “splayfoot” and the “winged,” and written in an alphabet whose transparency is only the others side of the invisible, “the muffled.” It must be that which, even in its plain saying, remains hidden, a zero of logic “rustling through the palms.” The book as music. Perhaps this is what I’ve been trying to say here all along. And I’ve said nothing about the rest of the book. Scattered with the kind of amusing bagatelles Palmer has always written, the highlights of the first section, “What I Did Not Say,” are the three series, “The Classical Study,” “Say,” and “Aygi Cycle.” The first of these features a playful figure called The Master, a kind of trickster male muse who calls to mind both Duncan himself and his Master of Rime: “The Master of Rime told me, You must learn to lose heart. I have darkened this way and you yourself have darkend. Are you so blind you cant see what you cant see?” Gnostic endarkenment subducts the poem into telluric currents of language. Or, as Palmer writes, it’s a game “where silence matters / above all, or do I mean sound?” (6). As the tender of silence and smallness, Aygi watches over the garden of ruins, where renunciation opens the portal to the field of the other. In Palmer’s reading, Aygi makes of childhood a space for “entering into awareness and into speech.” His Aygi is brought into conversation with Oppen’s elegy for Reznikoff, where the poem is written “in the great / world small.” Another thread woven, glimmering. Michael Palmer, Thread (New York: New Directions, 2011), 65. All subsequent page references will be placed in parentheses. Palmer, At Passages (New York: New Directions, 1995). Palmer, Active Boundaries: Selected Essays and Talks (New York: New Directions, 2008), 80. Robert Duncan, Roots and Branches (New York: New Directions, 1964), 77; H.D., Vale Ave (Redding Ridge, CT: Black Swan Books, 1992), 76. The Egyptian Book of the Dead, trans. E. A. Wallis Budge, 20, 263. Philip Dow, 19 New American Poets of the Golden Gate (New York: HBJ, 1984), 341. Palmer, Sun (Berkeley, CA: North Point Press, 1988), 9. Interview with Ken Bullock, April 7, 2006. Duncan, Roots and Branches, 170.